The Wade-Fite staining technique is a less common special staining useful in Histopathology. 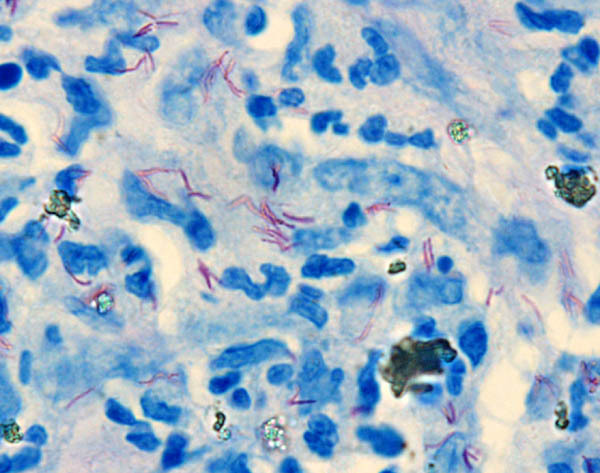 It is the modification of Ziehl-Neelsen Staining Method to demonstrate Mycobacterium leprae in tissue sections, which is much less acid and alcohol fast than the tubercle bacilli. Mycobacterium leprae in comparision to Mycobacterium tuberculosis are much less acid and alcohol fast. The leprosy bacilli’s lipid envelope is much more affected by the fat solvents (xylene) traditionally used to dewax sections. Hence, they get frequently decolorized by the standard Ziehl-Neelsen technique. Due to these factors, a modification on the standard Ziehl-Neelsen staining technique, Wade-Fite staining technique is used for the demonstration of leprosy bacilli. The Wade-Fite technique combines the peanut oil with the deparafinizing solvent (xylene). This minimizes the exposure of the bacterial cell to organic solvents, thus protects the precarious acid-fastness of the organism. Slightly warm the sections and deparaffinize in a mixture of peanut oil and xylene (1:2), two changes, 6 minutes each. Blot dry and wash in running tap water for 3 minutes. Repeat if any xyline-oil remains on the section. Stain with carbol fuchsin at room temperature for 20-25 minutes. Wash in running tap water for 3 minutes. Differentiate with 3% HCl in ethanol for 2 minutes. The sections should be pale pink on rinsing in tap water. Wash in tap water for 5 minutes. Counterstain in acidified methylene blue for 20-30 seconds. Wash in running tap water, donot dehydrate in alcohol. Blot sections dry and then place in 56C oven for 5 minutes. Once dry, one quick dip in xylene to clear. Mount with permanent mounting media. in original staining technic.equal part of liquid petrolatum and rectified turpentine.